In a large bowl, mix the chorizo, beef, Ham Base and black pepper. Form into 4 equal patties. Mix the mayonnaise and Mexican seasoning in a small bowl and set aside. Heat the grill to 450°F. Place the burgers directly onto the grill and grill for 5-6 minutes per side. Carefully remove the burgers from the grill to a platter using a long handled spatula. 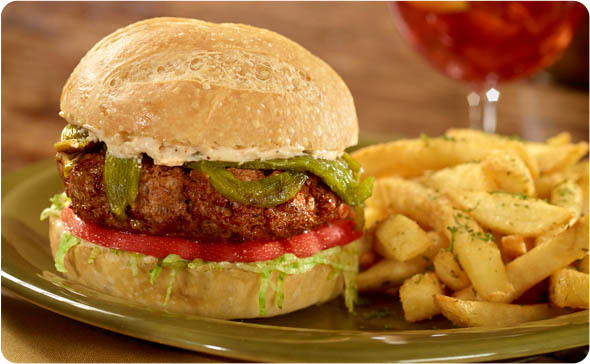 To serve, spread the mayonnaise mixture evenly among each bottom bun, top with the burgers and one roasted pepper each.